It’s a balancing act. 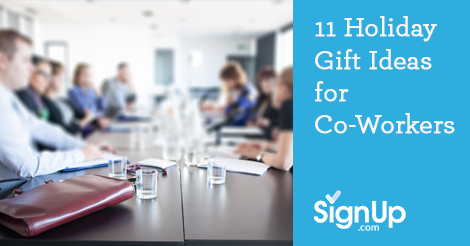 You want to give your co-workers a little something at the holidays, but you don’t want them to feel obligated to give you something in return. Here are 11 fun and thoughtful gifts for under $10 that will help you spread the holiday cheer! 1. Tea. Give a travel tin of tea bags or a box of your favorite herbal tea for an aromatic warm-up this winter. 2. Chocolate. You can’t go wrong with chocolate, because if your co-worker doesn’t eat it, chances are he knows someone who does. A small box of four Godiva truffles is affordable and thoughtful and with any luck, just enough to share! 3. Hot Sauce. Give the firebrand in your office some serious heat with a collection of hot sauces. 4. Candles. Give the relaxing gift of aromatherapy in candle form! 5. Aromatherapy. Therapeutic-grade essential oils in holiday scents are a lovely way to celebrate the season. 6. Cookies. Give a small package of adorable holiday cookies, or bake your own, and package with cookie cutters and sprinkles. 7. Dog Treats. For the dog lover in the office, bake or buy festive dog treats in holiday-themed shapes. 8. Salt. One staple used by every cook is salt. Give pink Himalayan salt or other flavored salts (found in most gourmet grocery stores) to the gourmet in the next cubicle. 9. Personalized Notecards. Personalized stationery is not nearly as expensive as it seems. Order and give to the coworker who never fails to send handwritten thanks and encouragement. 10. Luggage Tags. For the sales team, give unique luggage tags to help speed up the baggage claim process. 11. Lip Balm. For the office mate who suffers from the dry heated office air, a set of mini lip balms or a tube of luxurious hand lotion might be just the ticket.